Azure IoT Edge is a fully managed service that allows you to deploy Azure and third-party services—edge modules—to run directly on IoT devices, whether they are cloud-connected or offline. These edge modules are container-based and offer functionality ranging from connectivity to analytics to storage—allowing you to deploy modules entirely from the Azure portal without writing any code. You can browse existing edge modules in the Azure Marketplace. Today, we’re excited to offer the open-source Azure IoT Edge runtime preinstalled on Ubuntu virtual machines to make it even easier to get started, simulate an edge device, and scale out your automated testing. Azure IoT Edge deployments are built to scale so that you can deploy globally to any number of devices and simulate the workload with virtual devices which is an important step to verify if your solution is ready for mass deployment. The easiest way to do this is by creating simulated devices with Azure virtual machines (VMs) running the Azure IoT Edge runtime to scale your testing from the earliest stages of development—even before you have production hardware. On first boot, the Azure IoT Edge on Ubuntu VM preinstalls the latest version of the Azure IoT Edge runtime, so you will always have the newest features and fixes. It also includes a script to set the connection string and then restarts the runtime, which can be triggered remotely through the Azure VM portal or Azure command line, allowing you to easily configure and connect the IoT Edge device without starting a secure shell (SSH) or remote desktop session. 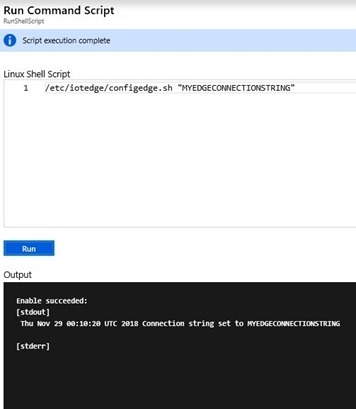 This script will wait to set the connection string until the IoT Edge client is fully installed so that you don’t have to build that into your automation. The initial offering is based on Ubuntu Server 16.04 LTS, but other operating systems and versions will be added based on user feedback. We’d love to hear your thoughts in the comments. You can deploy the Azure IoT Edge on Ubuntu VM through the Azure Marketplace, Azure Portal, or Azure Command-line. Let me show you how to use the Azure Marketplace and the Portal. 2. Select “GET IT NOW” and then “Continue” on the next dialog. 3. 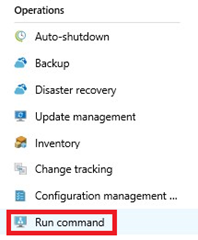 Once in the Azure Portal, select “Create” and follow the wizard to deploy the VM. If it’s your first time trying out a VM, it’s easiest to use a password and enable the SSH in the public inbound port menu. If you have a resource intensive workload, you should upgrade the virtual machine size by adding more CPUs and/or memory. Wait a few moments, and the screen should then provide a success message indicating the connection string was set successfully. 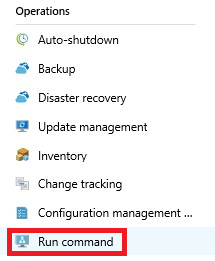 If you’re already working in the Azure portal, you can search for “Azure IoT Edge” and select “Ubuntu Server 16.04 LTS + Azure IoT Edge runtime” to begin the VM creation workflow. From there, complete steps 3-5 in the Marketplace instructions above. If you’d like to learn how you can deploy these virtual machines at scale, check out the “Deploy from Azure CLI” section in the Run Azure IoT Edge on Ubuntu Virtual Machines article. Now that you have created an IoT Edge device with your virtual machine and connected it to your IoT Hub, you can deploy modules to it like any other IoT Edge device. For example, if you go to the IoT Edge Module Marketplace and select the “Simulated Temperature Sensor,” you can deploy this module to the new device and see data flowing in just a few clicks! Next, try deploying your own workloads to the virtual machine and let us know how we can further simplify your IoT Edge testing experience in the comments section below or on user voice. Get started with Azure IoT Edge on Ubuntu virtual machines today!